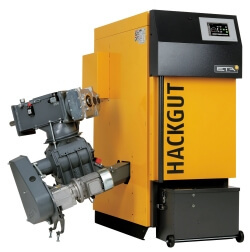 Wood chip provides an automated fuel delivery option from the store to the boiler by means of augers. Depending on the type of chip used and moisture content – differing wood types have different energy contents – generally chip has a lower energy content and is a bulkier material than wood pellets requiring a larger fuel store for the delivery of identical energy requirements. Many wood chip boilers are capable of burning miscanthus (elephant grass) a fuel specifically grown for use in biomass boilers.